We are committed, as a Company, to minimising damage to the environment, and we believe that our clients have a similar commitment. We and they are increasingly aware of the effects of landfill, traffic and air pollution, and the need to conserve natural resources such as wood; we are rightly held to account for our role in protecting our environment. Where possible, we use locally sourced wood – supporting businesses in the area and helping to reduce the pollution caused by long distance haulage. Our wood comes from suppliers who manage their forests responsibly – look for the FSC trademark which means that wood is produced in accordance with the rules of the Forest Stewardship Council. Wood that is protected and well maintained is extremely durable: a kitchen built in solid wood can last a lifetime. 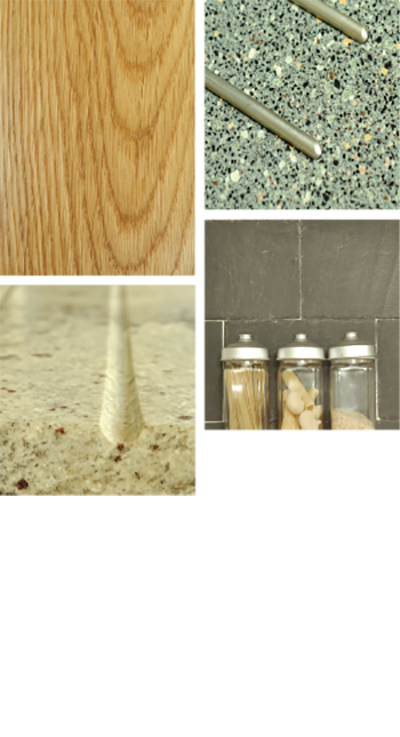 Additionally, we offer customers the option of fittings that use reclaimed materials, such as wood that can become hand turned door furniture or worktops made of shards of different colours of broken bottles fused to create a solid, granite-like surface. All the elements of an old kitchen can be recycled, from the wood of the units to the white goods – we can put customers in touch with organisations that will help them to recycle what is no longer wanted. Appliances that we source for clients have, as far as possible, a triple A rating for efficiency. We can incorporate recycling and composting bins within our kitchen units, so that clients have the opportunity to recycle their own waste products efficiently. In our workshop, we are committed to care of the environment in disposing of our own waste products: we give our sawdust to local farmers, use our small offcuts of wood for heating, and dispose safely of those materials that we can’t burn. In a continuing search for new ways to protect our planet, we are currently researching the use of natural paints for our hand-finished furniture.